Leif Brevik is in Snowberry Creek, Oregon, to help his Army buddy Nick Jenkins restore the home of their fallen comrade Spence Lang and transform it into a bed and breakfast for Spence’s best friend and heir, Callie Redding. Leif’s condition is similar to Nick’s when he first arrived in Snowberry Creek. He’s still recovering from an injury received in the same battle in which Spence lost his life. He is also suffering from PTSD, and since the doctors have refused to clear him for active service, his military career may be over. Nick’s invitation offers Leif not only a chance to honor a friend, but also a chance to restore purpose to his life. Former military nurse Zoe Phillips has her own PTSD issues. Although she has returned to civilian life and is working as a nurse practitioner in Snowberry Creek, she has never really healed from the psychic wounds she received during her time in the military. Her wounds may be less visible than Leif’s, but they are no less real. And she is no less in need of healing and resolution. Leif and Zoe meet at a party to celebrate what has been accomplished thus far with Spence’s house. The attraction between them is immediate and powerful, but when Leif begins physical therapy, he finds that Zoe is the nurse practitioner in charge of his care. Zoe firmly adheres to professional policies that forbid personal relationships between medical staff and their patients. Zoe’s knowledge of his medical history and physical limitations embarrass Leif and deal a blow to his pride. These obstacles to a romantic relationship between these two may seem insurmountable, but the connection forged by their shared experiences, their instinctive understanding of one another, and the strong physical attraction they cannot ignore prove irresistible. Their path to an HEA is not an easy one. 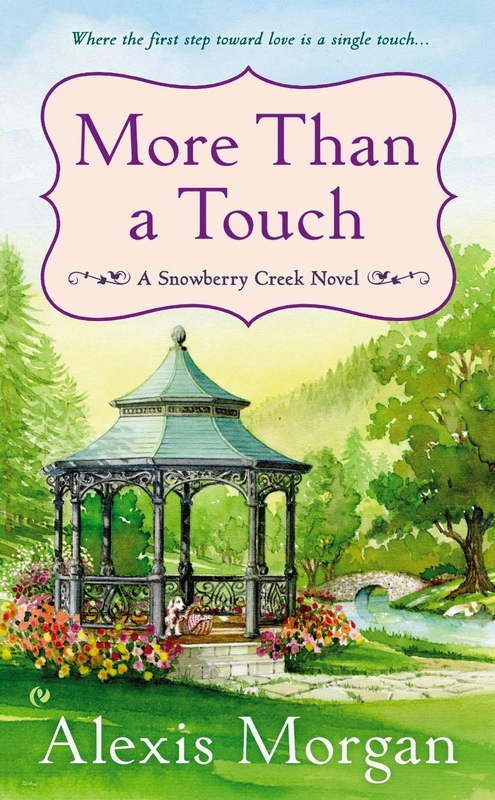 More than a Touch is the second novel in Morgan’s Snowberry Creek series that includes “A Soldier’s Heart,” a novella that introduces Nick Jenkins, Leif Brevik, Spencer Lang, and Mooch, their four-legged warrior comrade; A Time for Home, the first novel that features Nick and Callie; “The Christmas Gift,” a novella in Christmas on Main Street that is a Snowberry Creek story but not directly related to the three Army buddies. Morgan combines the appeal of a small-town setting with the emotional punch of stories featuring heroes who are veterans scarred by war experience. Her heroes are engaged in rebuilding their lives in a town with a distinctive identity and a full cast of interesting people. The combination is not unique, but, like Robyn Carr and JoAnn Ross, Morgan gives readers characters with flaws, complexity, and a high likeability quotient and confronts them with conflicts that are credible and compelling, thus producing stories that stand out from others in the subgenre. Leif and Zoe’s story is sometimes painfully real. Both the physical and psychological traumas that veterans carry with them from the war zone are presented vividly. Some studies place the PTSD rate among veterans of the Iraqi-Afghanistan wars at 20 percent, but other experts believe it is much higher. Such statistics, which have been widely reported, give an added level of reality to this story. More Than a Touch is the kind of book I like best, one that focuses on relationships and allows them time to develop, the kind that keeps the romance central but shows the protagonists within the contexts of other relationships with family and friends. If you like this kind of book too, I think you will enjoy More Than a Touch. While I recommend the series, this book can be read as standalone. Second chance is a theme that runs through the entire series. The theme reaches its zenith in the third Snowberry Creek novel, A Reason to Love, which will be released May 6. It is the story of Spencer Lang, the hometown hero believed to have been killed in Afghanistan. I look forward to returning to the small Oregon town for Spence’s story. This author is new to me and so glad I found her. I LOVED THE FIRST BOOK was happy to see there were at least 2 more and so happy that Spencer is alive. I hope there will be more in this series. Will have to see if I can find out on Alexis' site. Would you happen to know? Thanks for answering Pat's question, Donna! I read the first book and really liked it...happy to know there is a new one (how did I not know this...lol) I am ordering it right now... glad there will be another soon. Thanks for the review!! Adding this series to my buy list. Sounds like one I'd enjoy. Thanks, Janga! Great review! Sounds like a wonderful book. Thank you for the review. I have this series on my list & look forward to reading it. I have not yet read any of her books. This is a sub-genre I like. It often brings out what veterans have gone through and the problems they have dealing with them. I found some excellent early books that dealt with Vietnam veterans, some also nurses. It will be interesting to see how these compare in both style and in content. Janga, thank you for making me aware of this series.